If you’re like me, Jurassic Park taught you two valuable lessons: genetic engineering has to be dangerous, and the coolest scientists are chaos obsessed mathematicians. Fifteen years later, I’m throwing both of those lessons out the window with the help of the new biohacking web-hub DIYbio.org. In the first part of our story we talked about the DIY biology movement and what it might mean for the world. Now, let’s put on our Jeff Goldblum glasses, bust out our lab coats and get to talking with some of the coolest researchers I’ve met: the founders of DIYbio Jason Bobe and Mac Cowell, and long-time contributor Bryan Bishop. The success of DIYbio.org was less engineered than the genetic work they discuss. The idea started as a simple way to get people together who might be interested in the subject. Soon the listserv was growing like bacteria on a petri dish. It was a case of being at the right place at the right time, with the right determination. In DIY biology we see the convergence of three major trends: a rising youth culture trying to make its positive mark on the world, the free exchange of information and expertise via the Internet, and a growing abundance of quality genetic engineering tools. Sitting at this nexus, DIYbio is a rising star already drawing attention from major news media, the scientific community, and the Internet populace at large. The timing for DIYbio may be fortuitous, but it still takes a lot of dedication and hard work to bring a web-based community together. By carefully considering the long term needs and consequences of their group, the founders of DIYbio have helped shape its success. Despite this rapid success and the promise of much more, the founders of DIYbio.org are pretty grounded guys. They are focused on keeping the movement healthy and sustainable. Talking with Mac Cowell I was impressed by the thought and planning put into developing the community he is helping to build. This is not only a guy who talked his way into a job at MIT and the International Genetically Engineered Machine Competition (iGEM), he’s someone with a vision on how all of this DIY biology will need to be shaped as it moves forward. Jason Bobe is a man with a finger on the pulse of his community. He knows what is happening at DIYbio and the greater scientific world as well. Talking with Bobe, you get the feeling that he’s in this to help others and to expand humanity’s understanding of the natural world. That’s pretty fitting considering he is part of George Church’s Personal Genome Project. In our interview, I asked him to let us know more about some of the current and upcoming projects coming out of DIYbio. Since April 2008, Bryan Bishop has been a presence at DIYbio.org. To say he’s a regular contributor is sort of like saying tweens are regular contributors to Jonas Brother concerts. Self-professed Internet-guy, Bryan has his hands in a lot of pies. He helped spread the interest in playing with sharpie microfluidics (take two pieces of glass, a marker, some water and watch the science happen! ), and he keeps an eye on self-replicating fabrication whether it be mechanical or biological. Singularity Hub’s long chat with Bryan can be seen in its entirety here. 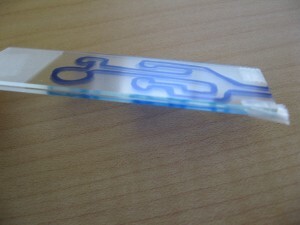 In “sharpie microfluidics”, a lab is drawn on two glass slides to provide surface tension restricted experiments in microfluidics. The work of these three gentleman scientists is anything but chaotic. With careful planning and consideration they are helping shape the future of an emerging field. Their examples point out that DIY biology isn’t do-it-all-alone, or do-it-without-guidance; even if they do like to define their roles as facilitators, not leaders. DIYbio.org and the DIY biology community as a whole are surely better off for their work. And hopefully they’ll help keep us safe from the inevitable dinosaur rebellion.